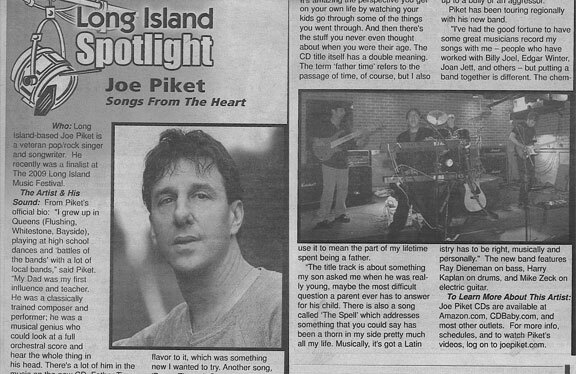 Long Island-based Joe Piket is a veteran pop/rock singer and songwriter. He recently was a finalist at the 2009 Long Island Music Festival. "I grew up in Queens (Flushing, Whitestone, Bayside), playing at high school dances and ' battle of the bands' with a lot of local bands. My Dad was my first influence and teacher. He was a classically trained composer and performer; he was a musical genius who could look at a full orchestral score and hear the whole thing in his head. There's a lot of him in the music on the new CD, FATHER TIME. The first song, 'Payin' The Price For Spring', looks back at his life and my relationship with him, and also looks at the present and future in terms of watching my own kids growing up. It's amazing the perspective you get on your own life by watching your kids go through some of the things you went through. And then there's the stuff you never even thought about when you were their age. The CD title itself has a double meaning. The term FATHER TIME refers to the passage of time, of course, but I also use it to mean the part of my lifetime spent being a father." The title track is about something my son asked me when he was really young, maybe the most difficult question a parent ever has to answer for his child. There is also a song called "The Spell", which addresses something that you could say has been a thorn in my side pretty much all my life. When you hear the words you know what I mean. Musically, it's got a Latin flavor to it, which was something new I wanted to try. Another song, 'Peace Through Strength' pays tribute to the great people in the military who protect us and enable people like me to raise our families and live our lives, and talks about what happens when you don't stand up to a bully or an aggressor." Piket has been touring regionally with his new band. "I've had the good fortune to have some great musicians record my songs with me - people who have worked with Billy Joel, Edgar Winter, Joan Jett, and others - but putting a band together is different. The chemistry has to be right, musically and personally". The new band features industry veterans Ray Dieneman on bass and Harry Kaplan on drums, along with talented newcomer Mike Zeck on electric guitar.